As a professional real estate agent you know that in order to compete on the internet today, you need to have IDX integration with your real estate website. Let’s face facts here, search engines are king when it comes to the internet and if you want to get your website found then you need to have a website that has what searchers are looking for or they will never find you. Yes, there are other factors that should be taken into consideration as well, such as backlinks, meta tags and keyword placement, but the simple fact is that you can fail at almost every other aspect of SEO but as long as you have good, fresh content on your website at all times, you will always outrank those who don’t. Period. 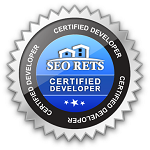 SEO RETS is an advanced real estate plugin that was built using fundamental search engine optimization principles. Unlike most other IDX plugins, it integrates the MLS into your real estate website WITHOUT using Iframes or Subdomains. This helps ensure your real estate website gets the credit for the content from the MLS.